The change of season puts a spring into everyone’s step, including those working in marketing. 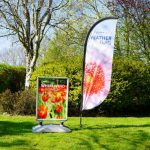 To prepare the busy up-coming schedule of outdoors and open air events, Printdesigns has released its latest collection of bundle deals, curated to suit the needs of its clients as they move their promotional efforts outside. This recent range of bundle offers is the first offered by the premium printing expert, after it relaunched its website in February. Adapting its digital offering to make the purchasing process simpler for its customers, these seasonal-ready promotions are the first of many to come throughout the year from the client-focussed wide-format printing provider. 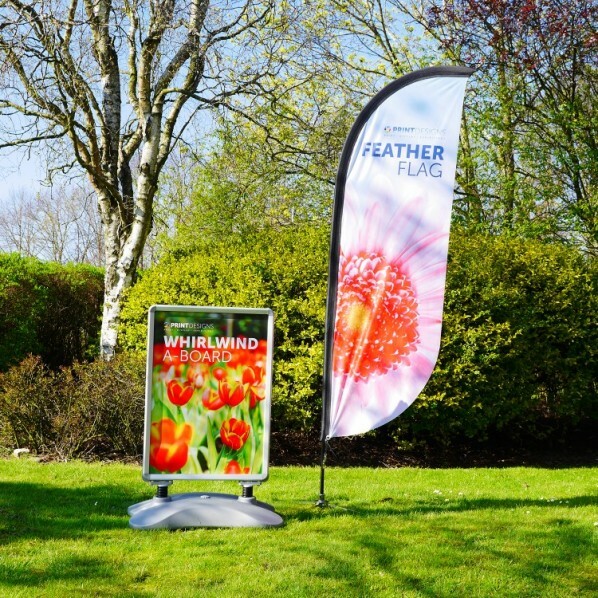 The teardrop and feather flags are a best-seller for the printing company, and this summer season it is offering these lightweight, portable solutions alongside a variety of banner stands to quickly make a large impact in any small space it is placed. With the ‘pick up and go’ Horizontal Spring Up, the A-board style Whirlwind stand and robust Monsoon banner available, Printdesigns’ selection of flag deals is versatile enough to suit all outdoor occasions such as markets, festivals and more. While these flag bundles are perfect for when time and space is limited, more traditional banner and pop up stand styles are also available, paired with table top or counter products to create a formal booth or stand in an instant. The Folding Table with full-colour stretch fabric is included in this seasonal promotion, one of the newer additions to Printdesigns’ portfolio, as well as products from the sought-after TEXStyle fabric range. With over a decade of experience, Printdesigns understands the changing needs of its clients, using this knowledge to provide the best, most effective products on the market.